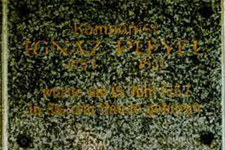 On the occasion of Ignaz Joseph Pleyel's 200th birthday, on 16 June 1957 this memorial plaque was affixed to the birth home of the composer. Unfortunately the name of I.J. Pleyel was soon forgotten again. Until 1996, that is, because in that year the former school of Ignaz J. Pleyel, directly next to the birth home of the future composer, was saved from demolition. Pleyel's birth home as a ruin Practically at the last moment, the building in which Pleyel obtained his first education from his father, was able to be spared from certain demolition by the International Ignaz J. Pleyel Society (IPG). Considerable recognition is due to the President of the IPG, Adolf Ehrentraud (pictured on the left), without whose untiring efforts this unique cultural site of Lower Austria would no longer exist. It had been partially used as a refuse dump. 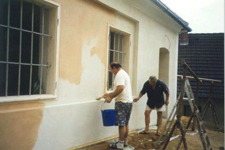 Restoration work Help was urgently required from all sources. The Museum Director and President of the IPG lent a strong hand. IPG Pleyel Museum Between 1997 and 5 September 1998 the bulk of the restoration work had been completed, and thereafter the Pleyel Museum was in a fitting state as a memorial to the composer. 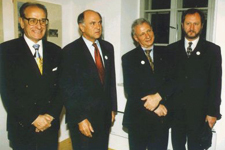 The Director of the Lower Austria Studio of the Austrian Broadcasting Corporation (ORF), Dr. Paul Twaroch, the Governor of Lower Austria and State Culture Counsellor, Dr. Erwin Pröll, the President of the IPG Adolf Ehrentraud, and the Mayor of Grossweikersdorf (of which Ruppersthal forms a part) in the Pleyel Museum (from left to right). 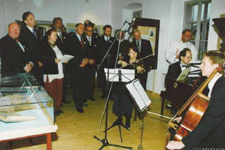 Inaugural concert in the museum Pleyel's oeuvre as a common European heritage: second from the left, as representative of the nation which welcomed Pleyel as one of their own: the French Cultural Attaché Werner Rauch during the performance of one of the piano trios composed in Strasburg, on the occasion of the opening of the museum. Playing the Pleyel piano is Prof. Hrvoje Jugovic. How did this building, which was no longer an official school after 1894, become a museum? Before World War II ended this school building was already used by occupation troops; the beloved and meritorious chorus mistress Mrs. Margarete Mayer lived here; even a hairdresser offered his services for a while in this desolate spot. In a small side room burial ground tools were stored. 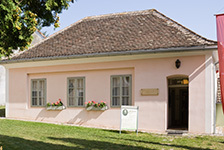 In 1995 this old school building was made available to the Ignaz Pleyel Dramatic Society 1908 (IPT) for an undefined period, for an annual rent of ten Austrian Schillings (approximately 77 Eurocents, or 50 p, or 1 US $). The municipality donated the building to the International Ignaz J. Pleyel Society (IPG) in 1996. 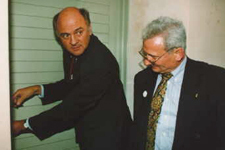 Governor Dr. Erwin Pröll, saddened at the desolate state of the historic school building, approved immediate help on the occasion of a Pleyel CD presentation. 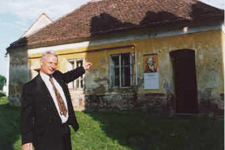 The Construction Guild of Lower Austria, represented by Guild President Manfred Schuster of the Construction School in Hainburg Castle, was won over to perform the restoration work. 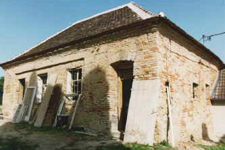 Restoration began on 30 September 1996. After some 2700 man-hours of labour and at a cost of approximately 1.9 million Austrian Schillings (approximately € 147,000, GBP100,000 or USD 190,000 US), the building was restored in late 1998. The effort has been worth it; following the opening by Governor Dr. Erwin Pröll and the blessing by Father George Buis, the only Pleyel Museum in Austria is proudly presented to the public. Piano, op. 1614 The purchase of the grand piano was made possible thanks to generous financial support of the Government of Lower Austria. The piano is marked as Opus Nr. 1614, was built in January 1831, placed on sale in the shop in April 1831, and purchased by a Monsieur Biralle in May 1831 for 2800 French francs. 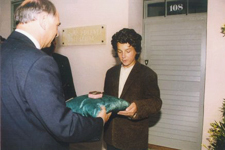 It was purchased by the International Ignaz J. Pleyel Society (IPG) for the museum. The keyboard is of ivory and ebony, and has a span of six and a quarter octaves (C to f''''); its cover has a remarkable shape of a quarter cylinder. The piano has an English action; the hammers are covered with an outer felt layer. The lyre has two pedals: forte and una corda. Cast iron bars beneath the resonance board strengthen the wooden frame. The instrument is completely playable and has been used for the recording of several CDs, among others of the 19 Polish songs of Chopin by Young-Hee Cho (soprano) and Christopher Grasser (CD Quantum 6900) and a sound track recording for the film "La note bleue" on Chopin (CO Opus 111). The piano manufactory was managed by Auguste Wolff (1821 - 1887), son-in-law of Camille Pleyel, and later by Wolff's son-in-law Gustave Lyon (1857 - 1936). 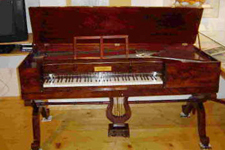 The original Pleyel table piano, Opus 7134, has been made available on loan to us by the Lower Austrian Hypo Bank. 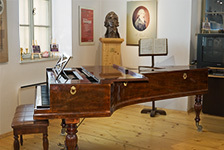 The room of the museum, in addition to its exhibition function, also provides an intimate environment for the now very popular museum concerts, in which the music of Pleyel and of his contemporaries are performed, both on the grand and the table piano, by well-known artists, and thus brought to the ears of the world again.